Mida d'aquesta previsualització PNG del fitxer SVG: 700 × 600 pixèls. Autras resolucions : 280 × 240 pixèls | 560 × 480 pixèls | 896 × 768 pixèls | 1 195 × 1 024 pixèls. This file is one of several variants using different aspect ratios. 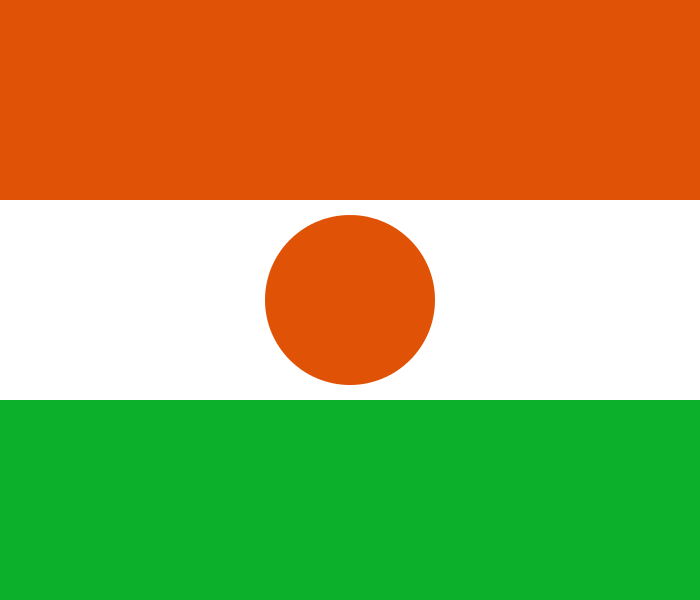 Note that the aspect ratio of the flag of Niger is not normative and even varies between various official sources of the Nigeran governments. Some variations should not be followed here (such as those with overprinting of the Niger country name, as found on the Nigeran parlement website, as this is not a flag but a custom iconography specific to those websites). This file was manually written with a very simple SVG syntax, with no software-specific attributes, and no complex 2D transformation, for accuracy and speed of rendering. Please learn to write SVG manually for best results and much smaller file sizes. The "burnt orange" color in the top band and circle is Pantone(166), i.e. RGB(224,82,6) = #E05206 on sRGB CRT screen, or CMYK(0,65%,100%,0) for process coated print, BUT NOT light orange #FF7000 which is somewhere between Pantone(130C) and Pantone(151), and is even lighter than X11 orange! See http://www.seoconsultants.com/css/colors/conversion/100/ The central white band is plain D65 reference white = RGB(255,255,255) = #FFFFFF. Autor Made by: Philippe Verdy User:verdy_p, see also fr:Utilisateur:verdy_p. This image is Public Domain by its author. actual 17 setembre de 2012 a 23.24 700×600 (296 octets) Zscout370 Whoever wrote it last didn't put the color tags in correctly. 28 març de 2007 a 09.01 700×600 (338 octets) Fibonacci Optimised code.